The wonders of garlic never cease to amaze us, and as this amazing plant rises in popularity in both equestrian and human usage, we thought we would delve deeper into why we believed garlic is so glorious. Let’s go back to basics now. We all have heard of garlic and probably have eaten it ourselves on many occasions. But what exactly is it? Garlic is part of the same family that onions, shallots and leeks come from – and this is in fact the lily family. Garlic is widely used across the world as both a culinary ingredient and as a healthy nutritious addition to human and animal diets. Garlic grows under the ground and forms a bulb, the outer edge of a garlic bulb is papery and inedible, but the head itself comprises of several individual ‘cloves’, each of which are wrapped in the same papery skin that the outer bulb is covered in. Once this layer has been removed there is a pale flesh which is the part that is used. How is garlic used to make horse supplements? The most commonly found way of feeding garlic is through either a garlic powder (dried and ground garlic cloves), dehydrated or freeze dried into pellets or granules, or more recently in a Pure Oil form. It is the Pure Oil form that we used in Horslyx Garlic Balancer as we have found it to be the most effective when combined with our unique combination of vitamins, minerals and trace elements. It also provides a cost effective equivalent to granules and powders – which have almost doubled in price over the past year! Why do we feed horses garlic? Garlic has been fed to horses for hundreds of years. The most commonly known benefit of garlic is the natural insect repelling properties it provides. When garlic is absorbed into the bloodstream, the highly pungent compounds cause the body’s natural secretions to become odorous and repellent to many flying insects. Which means, effectively, what garlic does, when fed in the right quantities, is create an invisible barrier that deters flies and midges from landing on the skin, thus relieving the irritation caused to horses and humans! ●	Garlic has natural antibiotic properties which helps to support a healthy immune system in horses and ponies. ●	Garlic contains antioxidants, including sulphur and selenium, which can work together with your equine’s natural defences to maintain optimum health and performance. ●	Garlic has been shown to support healthy breathing which makes it ideal to feed alongside a balance of other nutrients to help keep your equine’s respiratory system in peak health. While garlic is a truly wonderful ingredient, don’t dismiss the importance of balancing the diet in order to maximise the efficacy of this natural wonder. In order for garlic to work optimally, your horse’s overall health should be taken into consideration – particularly his skin health. This means it is important to ensure your horse has a balance of nutrients including chelated zinc, vitamin E and selenium in his diet to maintain healthy skin – this will help defend against further irritation caused by insects. We like to do our research here at Horslyx, which is why we are very proud that results from three separate studies at Aberystwyth University show that when fed continuously, for a minimum of 14 days, Horslyx Garlic Balancer can significantly reduce the irritation from flies and other biting insects and also have beneficial effects for those horses suffering with sweet itch. Horslyx Garlic Balancer is in fact one of our best selling products, and despite the prices of garlic rising significantly this year – we have managed to keep the price down for our customers – meaning that feeding Horslyx Garlic Balancer is one of the most economical ways you can balance your horse’s nutrition AND provide them with the natural powers of garlic. Do you feed your horse garlic? 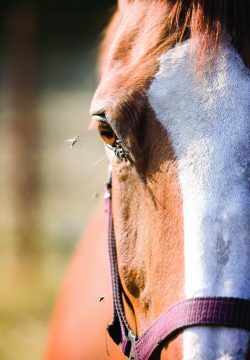 We would love to know if you have found it help relieve insect irritation to your horse. Head over to our Facebook page here and share your experiences.